Dolphin Port is a curving row of shops and restaurants near the ferry terminal. 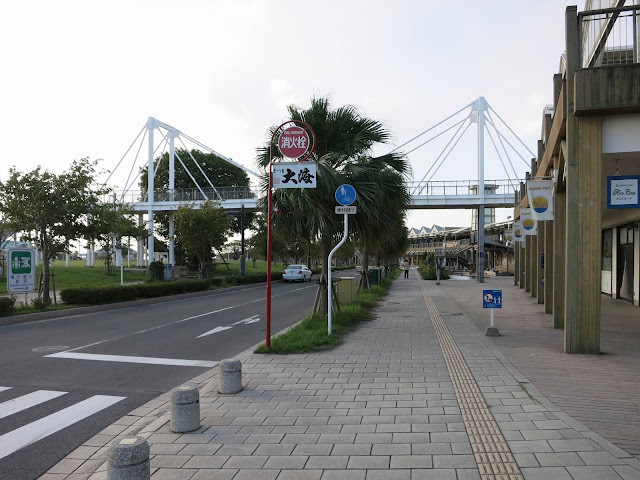 There are cable-stayed pedestrian bridges at each end of the 'Port' that carry people from the second story across the street and onto a park along the bay. The bridges end a little abruptly with stairways descending at right angles to the bridge. Kagoshima Prefecture, Japan's Bridges: Dolphin Port Pedestrian Bridges by Mark Yashinsky is licensed under a Creative Commons Attribution-NonCommercial-NoDerivs 3.0 Unported License.